When we say Shorkie are our PASSION we mean it and show it by not breeding any other breeds that are not apart of the Shorkie breed. The importance of focusing only on the Shorkie breed means we do not divide out attention amongst other breeds and can focus solely on the development of the Shorkie breed. What does that mean for our clients.? Simply put you are getting the best of the best when you adopt a Shorkie from Priceless Pups and a Shorkie from a breeder that has the longest lineage in the Shorkie breed that exists today. Not to mention if you compare the look of our Shorkies to other breeders you will clearly see the difference in our puppies and why we are the #1 Shorkie website in the world. We also have written the only book on Shorkies that exists in the world today. Our Shorkie breeding program gets 100% of our undivided attention and because of this we do miss a single detail and tell you in great detail about each and every puppy available and upcoming breedings that are planned. WE DO NOT DO OTHER MIX BREEDING . The only other breeding you will find on occasion is a Shih Tzu Litter and a Yorkie litter. The reason for that is we have to be able to keep puppies back for our own personal breeding program. We do not believe in inbreeding so it is important we do outcrosses( purebred breedings ( Shih Tuz or Yorkie) that are not related to our adults) to ensure you are not getting an inbred dog. BUT WE DO NOT DO OTHER MIX BREEDING of any sort and divide our attention else where. We are committed to the development and betterment of the Shorkie breed only. Health, temperament and puppy development are two topics that any responsible breeder must place at the top of their “to-do” list. For more than 24 yrs now years, I have practices these three things and share this info with puppy parents to be all over the world. I have devoted much of my time educating puppy parents on the importance of the BREEDERS role in the first 10 weeks of a Shorkie puppy's life. There is not one video on my site that you will ever see a scared puppy. Our videos get up and personal with the puppies and you can see their amazing happy go lucky temperaments. It is just another testimony to the attention our puppies get. Please understand when I say SHORKIES ARE OUR PASSION. That is all we breed and they are my everything to me. Dogs are my life and they are my KIDS WITH FUR!. They are not a sideline or a hobby; this is what I do. Different breeds of dogs and different mixed breed dogs have different needs and my main goal is to give our Shorkie puppies EVERYTHING they need so we can assure they are well rounded puppies. In the past we have bred other breeds but I always found my self torn by not fully feeling like I was giving our Shorkie breeding program all of my attention. So now my only focus is our Shorkie puppies and our Shorkie breeding program. This way we never have any accidental breeding for other males that would create different mixes. We pride ourselves in breeding only Shorkies and people have loved that. They love the fact that they truly are our passion and they are confident they are getting the very best Shorkie possible. A Breed Standard? What is it? What does it mean? – and just why are they so positively important to know about. To start, a breed standard is an official document written with one goal in mind: to provide a description of a breed that defines its look and character. I have written and set forth the standard for the Shorkie breed in the Shorkie Club Of America. In a sense, a breed standard is the blue print of a breed. It’s what makes each breed distinctive and different from any other breed so by not sharing my interest in other breeds. We want to breed as close to the Shorkie Standard as possible and not divide our attention to other breeds or mixes. Being that the Shorkie breed is in it's formative years this is where our attention needs to be to take them to the next level. Through our responsible and dedicated breeding practices of only breeding Shorkies, I believe the integrity of a Shorkie breed is not only maintained, it is improved through our selective breeding and health screening. Our parents have years genetic testing behind them and are puppies all have their preliminary screenings done prior to coming home to you to ensure the best of our ability you are getting a healthy Shorkie puppy. Compare that to the less responsible breeder, the backyard breeders and puppy mills, who breed dogs without regard to the standard, disregard things that define the breed, and ignore the importance of temperament and genetic health. This is where you CHEAP SHORKIE puppies come into play. But rest assured that 300 dollars wont be such a great deal one you have 3,000.00 medical bill and you are emotionally bankrupt due the heartache of your puppy suffering from a debilitating genetic issue that could have be avoided by choosing a responsible breeder. 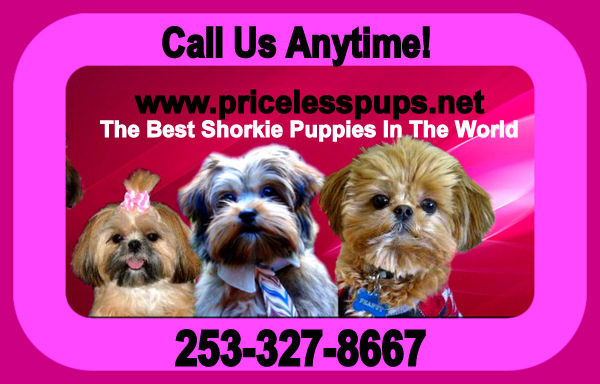 I think one of the biggest reasons we are the #1 Shorkie website in the World and the worlds #1 resource on Shorkie puppies is we tell it like it is. We are not here to try and sell puppies but rather educate people on how to adopt a healthy puppy. No matter what the breed is you are choosing. People like that fact that we only breed Shorkies and it gives them the comfort to know that our attention is focused on better the breed. I always tell people even if you don't get puppy from us! I am glad to have been able to educate you on the breed and what to look for in a Shorkie breeder. Please note: on very few occasions you will see Shih Tzu puppies and or Yorkie puppies on our website. Those are very selective breedings' we do to keep Shih Tzi females or Yorkie males back for our family once retire our moms and or dads. We have to have Shih Tzu up and coming Moms and new dads for our breeding program to ensure we never INBREED. But we do not do any other cross breeding or any other bleedings that do not support the betterment if the Shorkie breed.